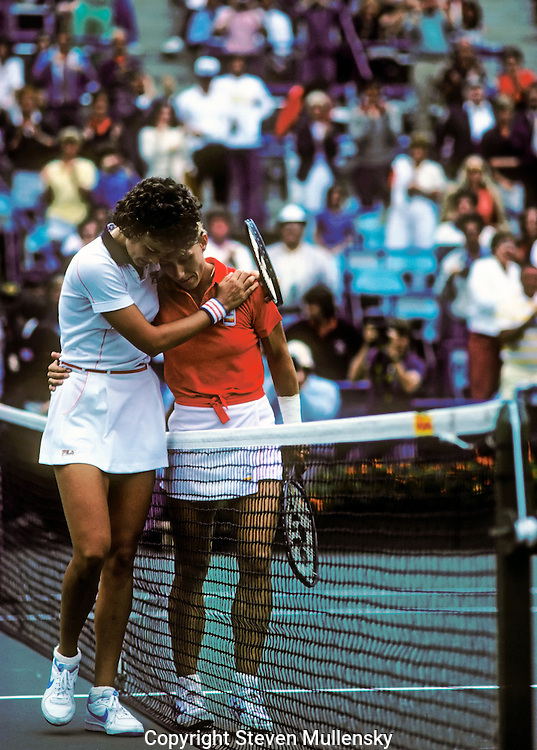 Pam Shriver and Martin Navratilova hug each other while leaving the court after Navratilove won their fourth round match during the 1981 US Tennis Championships in Flushing Meadow, New York. Pamela Howard Shriver Lazenby (born July 4, 1962, in Baltimore, Maryland), is a former professional tennis player and current sports broadcaster from the United States. During the 1980s and 1990s, she won 133 top-level titles, including 22 women's doubles titles and 1 mixed doubles title at Grand Slam tournaments. She also won a women's doubles gold medal at the 1988 Olympic Games in Seoul, partnering with Zina Garrison..Martina Navratilova (born October 18, 1956, in Prague, Czechoslovakia) is a former World No. 1 woman tennis player.